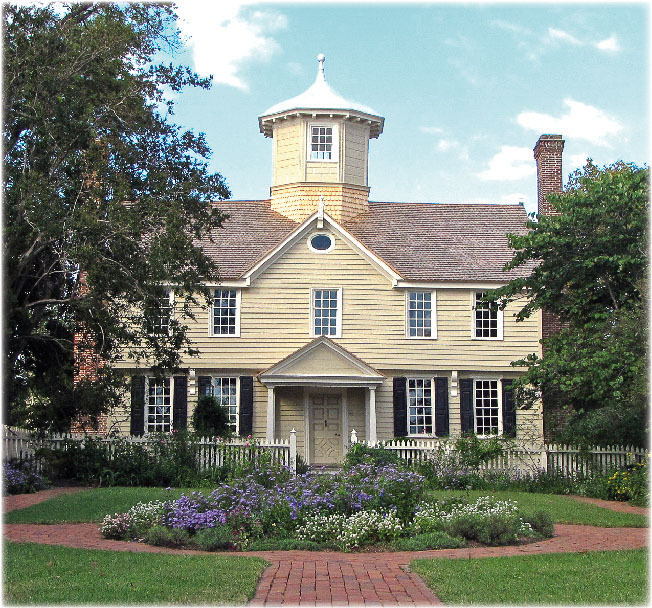 There are three areas of significance for the Cupola House that the visitor may want to explore—architecture; furnishings and artifacts; as well as the beautiful colonial gardens. The Cupola House is the most studied building in North Carolina. Thomas T. Waterman called it the finest example of Jacobean design south of Massachusetts. But historians have been puzzled by archaic features such as the overhang jetty, which was already out of style by 50 to 100 years; also, why such an overly large lantern cupola, and inside, why do the fine Georgian moldings over the doors and fireplaces jut up into the ceiling? Why is the second floor hall off kilter resulting in the south window out of vertical alignment with the front door and cupola? And the studies continue. In the last five years, as a result of restoration work, we are now certain that rusticated siding, not clapboard, covered the house. Look up at the rusticated siding around the cupola; that is the same style of rusticated siding that would have been on the body of the house. In addition, we now know that around the cupola there was a cantilevered, walk-able platform with balustrade, and the access door was in the southeast section of the cupola. The last resident of the house, Miss Tillie Bond, in 1918 wrote how her “great grandmother had tea with her friends on the veranda around the cupola.” No one believed this story, but it turns out she was right. The house has a mixture of three directions in furnishing. 1. Some quite old furniture from 1680 to 1750, mostly English, but some American, representing the first owner and builder Francis Corbin, land agent of the King’s last Lord Proprietor, Lord Granville. 2. Furnishings and artifacts original to the house from the very wealthy, second owners of the house—Dr. Samuel and Elizabeth Dickinson, who lived in the house from 1777 to 1820, although their descendants lived here until 1918. The three John Wollaston paintings, the two Felix Sharples and a William Williams portrait; the 1750 London clock; the hall mirror with sconces; the Newhall tea set, and three 18th century maps are all original to the Dickinsons. We have over thirty items from the Dickinsons, many were donated back to the museum by locals whose parents had purchased the items during the bad times (1910-1918, see the history below). 3. Local and regionally crafted furniture primarily from Edenton and the Roanoke River school of furniture. The majority are donations from local homes and plantations. There are regionally crafted items in each room of the house. The Colonial Revival Gardens, which surround the Cupola House, enhance the house and provide a place of quiet beauty in Edenton’s business district. Donald Parker, a Colonial Williamsburg landscape architect, initially designed the Gardens. His design was based roughly on the second C.J. Sautier 1769 Edenton map. The garden volunteers make every effort to grow plants that could reasonably have been grown here before 1800.